I can not complain about the briefcase. The quality for the price is a best bet. I alternate between it and a smaller iPad Pro case. Sometimes I have to carry both my iPad Pro and my laptop. This briefcase easily stores both and other office supplies like pads, pens, etc. Never a problem at the airport. Dimensions 16.0 In. X 3.75 In. X 12.0 In. The bag is of better quality than I had anticipated when ordering. Great look and feel. Easily holds my laptop, client notes, office extras and cords. Quite pleased! I purchased this to use in my real estate business. It has is nice looking and has plenty of pockets and compartments for all your needs. Great look, nice style, many compartments! I love this briefcase. The leather is great looking, the compartments are plentiful. I'm able to fit my iPad in one compartment and my MacBook Pro in another and even still the chargers in another. This case holds my files and paperwork, my pens, wallet, phone, etc. The back compartment holds my keys for quick and easy access. I don't use the shoulder strap but the handles are strong and sturdy. I have a lot to carry and even still I'm not using all the compartments. It's a great briefcase, stylish and practical. I've received compliments on it at the office. A great investment! 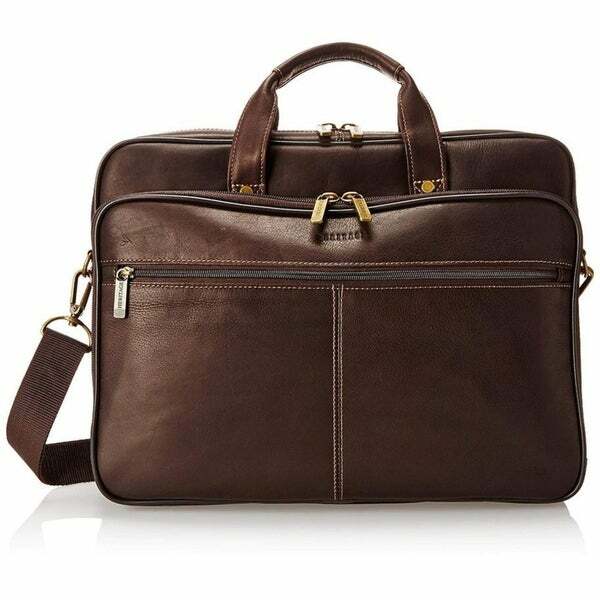 High Quality, Versitile, Impressive Looking Briefcase! This briefcase has a padded, safe place to protect/carry your laptop as well as multiple inside pockets to organize your office/business supplies as well as larger pockets to carry files and notebooks. It is the perfect "office-on-the-go" and one you can be proud of. Very sturdy case. Able to hold all books, folders and I-Pad comfortably. Lots of compartments for organizing. Seems to be holding up well. Would definitely order this product again! Looks just as it does in the picture shown (color, shape, material). Has a lot of pockets and space. Just perfect and my husband loves it. I bought this case as a Christmas gift for my grandson. He just started a new job as a salesman for an industrial company. It's a new world for him and I wanted him to have something to carry with him daily that would both assist him in his new job and remind him of our support. This case certainly does that! It's beautiful leather and beautifully crafted. I heard from him immediately when he received it and he loves it! He says he can carry all the information and files he needs in a day and it has room for his laptop, too. He especially likes the dual carrying option. Sometimes he can carry it with the shoulder strap but, if he wants, he can grab it by the convenient handle. I am delighted he's happy with it and I would certainly recommend it to others. Beautiful case at a very reasonable price! I bought the briefcase for a friend and she loved it. It is apparently of very good quality. I am purchasing another one for my granddaughter because she is in a business school. I love the fact that it is genuine leather and the price was very good for genuine leather. I was afraid I wasn't going to find it again because the price was right. I am very happy with this purchase and hope you continue to offer these at this price. It is a nice and sturdy leather briefcase. Thanks for offering this because the other genuine leather cases were quite over priced for my budget. I was really disappointed when I opened the delivery. First- the color is not as pictured. I ordered brown and it is not a rich mahogany color like the photo. It's almost black causing me to think they sent me the wrong color. However, the tag says that I do, in fact, have the brown bag. Second, the leather does not smell or seem real. The website says that it is.. maybe it is but it doesn't feel like an expensive product. Third, the inside lining is what you'd see in a backpack. It seems cheap and it's not attractive. So far no complaints, the bag looks really nice and it fit all my husbands stuff well. It was a gift for him and he really liked it. This is a beauty. Well-made, good value, durable. Purchased this for my husband and I love it! Quality seems to be good. Lots of storage. Great product and great price. Also got it a day than I was expecting which is always great. Over all it has done what it is needed to do. Would rebuy again if I needed to. Nice looking brief case . My son loves it! Very pleased with the quality and size of this bag. It can fit a laptop, a few books, and everything that would be needed for a day at the office. Worth the price! Very nice design and sturdy. Leather is holding up well- it is not super soft, but will last! Very nice leather Bag..Will recommend it highly. This is a very attractive bag. I travel a lot so it got well used. Unfortunately the zipper started pulling away from where it was attached and I had to retire it. I did enjoy it while I could. "My husband had 20" laptop just want to know if it will fit in this bag?" This bag will not fit a 20” laptop. "This Product says it has carcinogens. Can you please tell me what subtatances care contained in the product? Through which way are you exposed ? what part of the bag is the substance? And how can I limit the exposure? " We include the prop 65 warning as it is required by law for any item that may be sold in the state of California. "Does this briefcase stand up on its own, doe not lay on side when you let go?" "Does this breifcase have a strap or flap that allows is to slide onto the handles of a rollerboard suitcase?" Just the handles on the briefcase. Looks like a very nice quality product...just what I've been looking for. The price is awesome!! Merry Christmas to myself. "Can you all Engraved the briefcase"
How to Change the Lock Combination on a Briefcase from Overstock.com. Our guides provide customers with information about how to change the lock combination on a briefcase.